In 2017, Khenmo spent a month at Samtenling. Asking “How we better support you?”, a special meeting ensued with the current leaders of the nunnery including long time former director Mrs Namlha Taklha, current director Acharya Ani Tsekyi, accountant and secretary Acharya Ani Kunsang, teacher Acharya Ani Yeshe, long time German sponsor Vajramala and German nun, Ani Jinpa along with Khenmo and VDN board member Joanne Swirez. During the meeting the Acharya nuns expressed their dreams for the future and obstacles the nunnery faced. In frank discussion, the long-term goal of proficiency in English and access to the larger world through competency in computers were determined to be problematic. In addition, the leaders of the nunnery, also had personal dreams of serving the Dharma as Dharma teachers and translators. Mrs Taklha anticipated future needs and potentials of the nuns to serve the larger Tibetan community such as hospice and elder care like the wonderful Catholic nuns. As each class produces more educated Dharma women their potential to effect the wider community as future leaders becomes significant. It became clear, that this moment in time was a wonderful opportunity for the nuns to step forward in determining a beneficial future in order to contribute to the lineage as an institution and individuals. To understand the full potential and range of choices for making the best decisions and for increased confidence in their abilities, the international nuns and women at the meeting felt it would be most helpful for the Samtenling Acharaya nuns to widen their horizons in a leadership program. The program would give them time to focus on English and computer skills, to experience women’s leadership as a norm in religious and secular communities, and have experiences allowing a wider world view informing their vision. This leadership program would be available to nuns selected by Samtenling, who have a commitment to return to Samtenling to share what they have learned. Khenmo Drolma of Vajra Dakini Nunnery, has committed to developing the vision into a fully active reality along with Mrs Taklha who, although no longer actively directing the nunnery, remains a close trusted advisor. The following description proposes a pilot program beginning in September 2018. 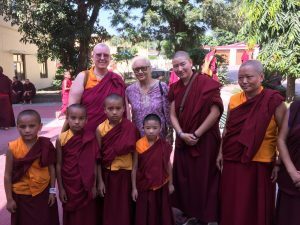 With the participation of women leaders in the Drikung across the US, we will further refine the vision as we welcome the first Acharya Fellow to work with us forming the program for future nuns. Goals: Giving identified future leaders international teaching and professional experiences particularly in programs that are led by women and models that could be duplicated or modified to benefit Samtenling Nunnery and the Drikung lineage as well as nunneries throughout India. Passing areas of knowledge to the early classes of younger nuns gradually affecting the whole nunnery and influencing aspirations and goals of all the nuns (90). Fellows would begin their experience in the US with language and computer skills at Vajra Dakini along with visits to western nunneries, inter faith and service events and programs designated as fitting the listed goals; including administrative experience. Vajra Dakini runs a variety of programs that the Fellow would participate in during her stay. These include Dharma teachings, retreats and interfaith events. Vajra Dakini organizes an annual Feeding the Hungry Walk for Buddhist Global Relief and volunteers at the local soup kitchens. Khenmo is on the Portland Interfaith Council and participates regularly in a variety of interfaith events that the Fellow would join in. Khenmo is on the organizing committee for the annual Western Monastic Gathering which models monastics of all Buddhist lineages working together across traditions equitably among genders and seniority. This reduces historic misunderstandings and prejudices that arose due to isolation among the traditions as well as models equal respect among genders. The Fellow would participate in this year’s gathering. Additionally, the Fellow would travel to other cities for further teaching experience and additional investigation of organizations as described. On her return to India, the Fellow would design a talk or workshop for Samtenling on her return, in which she would share her experiences. If the budget permits: inclusion of the Sakyadita International conference and potentially attending as a presenter. The ideal would be two nuns per year but we may begin with one nun. 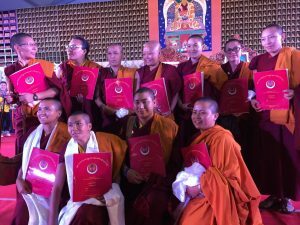 Adminstration: Vajra Dakini will host the Fellowfor up to 5 months and provide structured training in English and computer proficiency along with multiple Interfaith and Dharma activities. At least one internship relating to the Fellow’s goals for Samtenling nunnery and the Drikung Lineage is planned. Partners: Centers and or individuals who offer financial and or hosting experiences as outlined in the proposal. We envision 1-2 month residencies in participating sites that will help build an education module in the areas of Translation, Public Health Environmentalism, Education using new technologies.